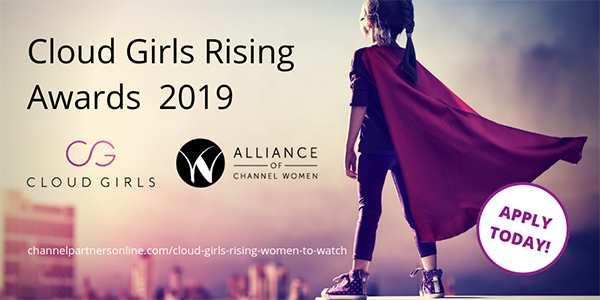 ALISO VIEJO, California – February 11, 2019 – Cloud Girls and Alliance of Channel Women have joined forces to present the fourth annual Cloud Girls Rising Award, Women to Watch, on April 11, 2019, at the Channel Partners Conference & Expo in Las Vegas. The application deadline has been extended to Friday, March 1, 2019. We’re honoring and recognizing women who have demonstrated innovation, solution-orientation and thought leadership in the cloud services space in the past year. “The Cloud Girls Rising award was created to honor women in the service provider, cloud provider and channel community who have shown leadership and innovation in the emerging cloud space. Our goal is to inspire more women to step forward and follow their example,” said Cloud Girls Co-founder Jo Peterson, vice president of Cloud Services, Clarify360. Trailblazer: A seasoned female technology industry veteran who is paving the way for her organization, customers and industry in advancing cloud and next-generation technology solutions. Rising Star: A female up-and-comer in the cloud community who has shown initiative in advancing cloud and next-generation technology solutions for her organization, customers and the industry. Women eligible for these awards are in sales, marketing or engineering roles at a channel partner organization — agent, VAR or MSP. To apply, visit https://virgoevents.survey.fm/cloud-girls-application. For more information, visit: http://www.channelpartnersonline.com/cloud-girls-rising-women-to-watch/. All applications must be submitted by March 1, 2019. Applications will be reviewed and scored by representatives of Cloud Girls and Alliance of Channel Women. Winners will receive a commemorative trophy, which will be presented on the Channel Partners Studio stage at the Channel Partners Conference & Expo at 2:55 p.m. on April 11, 2019.